Flat Dashboard Gauges for PowerPoint is a presentation template containing a creative speedometer design with flat styles and colors. 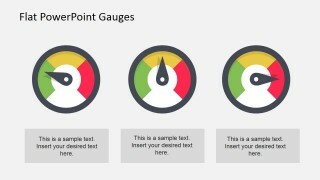 You can use this speedometer illustration to decorate your PowerPoint dashboards and presentations using flat gauges. Anyone having a driving license and a car finds familiar while driving the gauges installed in the dashboard. The focus of the driver is indeed on the road but the gauges let the driver have control over the automobile. The gauges show the status and health of different critical parts of the vehicle and alert the driver to take care of them when needed. 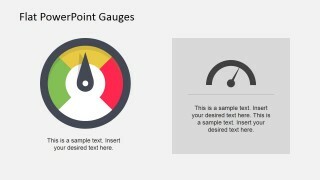 This modern PowerPoint template gives the familiar look of cars gauges in the presentation and dials at different positions on the gauges can be used to show performance. 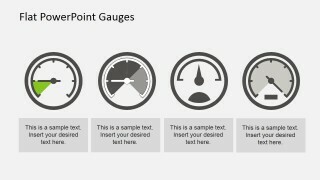 Different layouts of gauges and their dials are shown in this ppt template. They can highlight different aspects of a project. 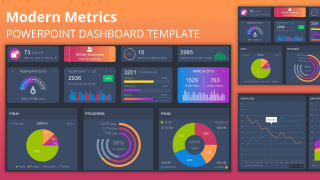 The template can be used to present any project key performance indicators (KPI) with bright colors of gauges and text placeholders. The central part of the project can be recommended by the speed gauge and its independent factors can be shown by the gear speed gauge. If different activities are linked together, they can use familiar gauges’ relation to show them. 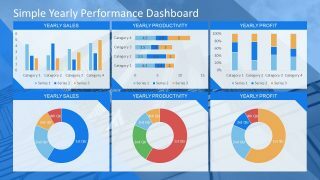 If there is some activity A that results in activity B and that in turn affects activity C, they can be personified by the gear speed, main speed and oil gauges respectively. 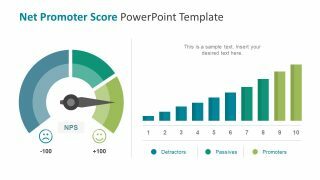 Speedometer vector clipart used mainly in this modern PowerPoint template is of different shapes and sizes, just as in a dashboard of a car. 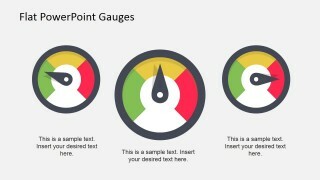 These different gauges can also be used to make a process flow presentations by linking the gauges with each other, with the available native shapes provided by PowerPoint. 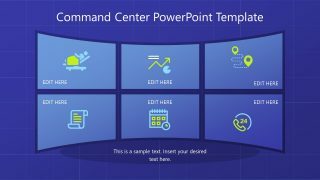 The template with bright presentation background images attracts the attention of audience, making it a great choice for status meetings or quarterly reviews.